Lux meters are used for measuring brightness in lux, fc or cd/m². 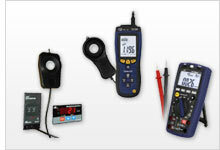 Some lux meters are equipped with an internal memory or data logger to record and save measurements. The measurement of light intensity with a lux meter is becoming increasingly important in the workplace due to safety concerns. PCE Instruments' lux meters with data loggers are highly regarded in the industry due to the devices' cosine correction of the angle of incident light. Many lux meters include software for detailed analysis and offer different interfaces for transferring measured data to a computer. The lux meter PCE-VDL 16I from PCE Instruments measures and stores the relevant measured variables: temperature, relative humidity, air pressure, light as well as acceleration in three axes by means of a vibration sensor. Therefore, this lux meter is ideal for monitoring vibrations on machines while simultaneously measuring and recording the relevant environmental conditions of the system. PCE-LED 20 is a lux meter with an external LED light sensor. The cable of the LED light sensor has a length of approximately 1.5 m / 4.9 ft. Accurate lux meter for the industrial sector. The PCE-174 Lux Meter with memory for up to 16,000 readings is used for measuring light in industry, agriculture, and research. The Lux Meter is also used for determining illumination in the workplace, shop window displays, and by designers. PCE-EM 888 is a portable handheld lux meter ideal for monitoring environmental conditions and the performance of heating, ventilation and air conditioning (HVAC) systems. This multifunctional digital device is used to measure wind speed, volumetric air flow, temperature, relative humidity, light and barometric pressure. The Lux Meter LXT consists of a measurement sensor and a small wall bracket or holder with a 1.5 m / 4.9 ft cable, and a light transmitter. The application field of the Lux Meter LXT is the continuous measurement of daylight and light control in photo labs and production facilities, such as in the manufacturing of food and medicine. Lux Meter PCE-170 A to 40,000 lux, internal sensor, automatic zero adjustment. The lux meter has a large measurement range, short response time and a compact housing allowing for quick, effortless one-hand operation. The LXT Lux Meter consists of a flow sensor with handle and a wall bracket to 1.5 m / 4.9 ft cable, a light transmitter, and a digital display. The main use of the Lux Meter is in the continuous light measurement and light monitoring of photo labs and production areas, such as food or drug manufacturing. The PCE-172 Lux Meter is used for accurate measuring of brightness in the industrial sector, commercial sector, agricultural sector, and for research. The lux meter consists of a measuring sensor with handle, a wall bracket with a 1.5 m / 4.9 ft cable, and a light transmitter. The main field of application of the light meter is the continuous light measurement and light monitoring of photo laboratories and production areas, such as food or drug production. The lux meter consists of a measuring sensor with handle, a wall bracket with a 1.5 m / 4.9 ft cable, a light transmitter and a digital display. The main field of application of the lux meter is the continuous light measurement and light monitoring of photo laboratories and production areas, such as food or drug production. PCE-L 100 is a high-accuracy lux meter that measures the intensity of both natural and artificial light rays. The PCE-L 100 lux meter or light meter also functions as a luminance meter (with optional accessory) to measure overlay and remote light density. The light transmission meter PCE-TT 100 is used to measure the transmission of visible light and UV light. For this purpose, the light transmission meter uses a light source and a spectrophotometric sensor. Essentially, the light transmission meter is used to measure the transmission of light through lenses, sunglasses and all other lenses. This thumb-sized Swiss Quality MSR145 Lux Meter records over 2 000 000 measured values - with an optional microSD card, even over a billion measured values - and is ideal for long-term measurements. It is capable of simultaneously measuring and recording a variety of measures such as temperature, humidity, pressure, 3-axis acceleration and light. Wireless monitoring of measurement data and rapid reading of measured values – this ease of use is offered by the new MSR145WD wireless Lux Meter. The Lux Meter is equipped with Bluetooth Low Energy, a bright OLED graphic display and the optional web-based service MSR SmartCloud for data monitoring from any location. The bestseller for transportation monitoring, fault diagnoses and load tests! The robust MSR165 Lux Meter is capable of making 1600 acceleration (shock, vibrations) measurements per second in all three axes. Shock monitoring with this Lux Meter is possible up to ±15 g or up to ±200 g, 32 measurement values are recorded even before the event takes place.